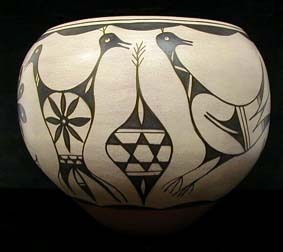 JUDY TOYA is the daughter of renowned storyteller artist, Mary E. Toya (d.), and the niece of Jemez mask maker Fannie Loretto, and storyteller potters, Lupe Lucero and Alma Concha. Judy was taught by her mother. 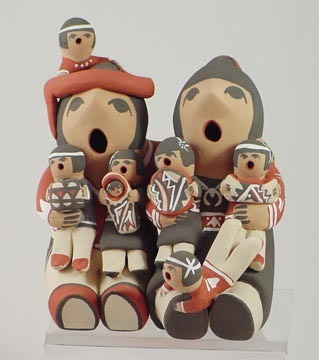 Judy's traditional Jemez storytellers are popular at Santa Fe Indian Market and the general public. 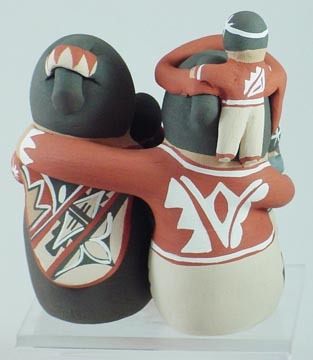 Judy Toya was born in 1953, is a member of the Water Clan and has been making pottery since 1972. She specializes in Storytellers, Nativity Sets, Christmas Ornaments & Friendship pots. She digs her clay from the Jemez Reservation, uses natural slips and fires her pottery outdoors. 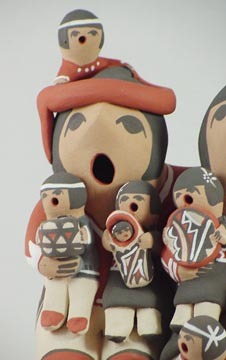 She won 1st Place for Nativities at Santa Fe Indian Market in 2000. She is the mother of Vernida Toya Chosa. 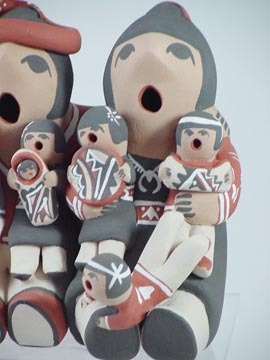 The couple storyteller pottery shown here has a mother and father singing to six children. Although young, Emma has been potting for over 20 years. A couple of years ago, Emma started making swirl melon pots, and this style has already brought her several awards. Emma was first taught to pot by her mother, Ida. Recently, she has studied under her aunt, Alvina Yepa, one of our featured potters. 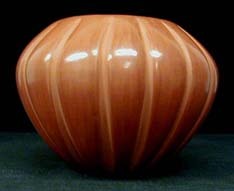 Here, Emma has combined the red and buff clays to form this beautiful swirl jar. Emma fires her pots using either red or buff clays, often mixing the two. This bigger cousin of her other swirl pots is terrific! Stone polished, deeply carved, well-balanced, full of presence and personality. The happy mix of clays is a favorite innovation of both Emma and Marcella Yepa, fine potters, but not yet household names. Everything is traditional: making the clay, coiling it, polishing the ribs with a stone, and firing in the ground. The colors are natural to the clays used. Here is proof that quality doesn't necessarily require a famous name! 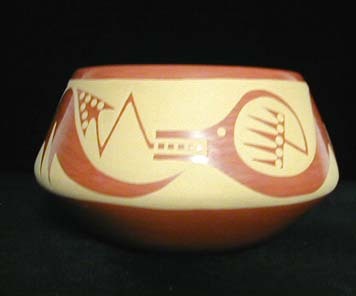 Item: Hand Coiled & Hand Painted Jemez Melon Pot by Emma Yepa. 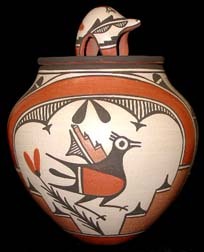 Pueblo: Jemez Artist Info: Emma Yepa was born on 5/13/1968 into the Jemez Coyote Clan. She was taught her craft by her mother Ida Yepa. 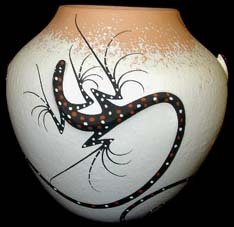 She specializes in stone polished redware and tanware, some sgraffito, melon swirl pots. She has won several awards and has been hard at work since 1981. Measurements: 3 7/8 inches tall, 2 inches wide. All measurements are approximate. Condition: New, no scratches, chips or blemishes. Signed: Emma Yepa Description: What a great design this small tapered Melon swirl pot has. It is unique and makes a statement. The base is painted in swirls of cream, rust and green which gives this pot an amazing contrast. Pictures cannot do it justice, don't let it pass you by!. Retail Value: $110.00. 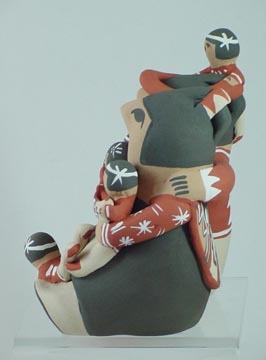 Emma Yepa was born in 1968 and has been making pottery since 1987. She specializes in stone polished Swirl Melon bowls, and seed pots. 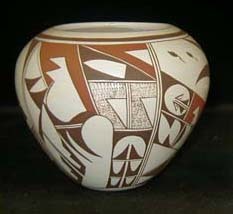 She digs her clay from the Jemez Reservation, uses natural slips and fires her pottery outdoors and in a kiln. She was taught by her mother Ida Yepa. 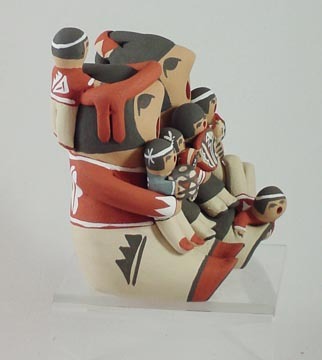 She comes from a very active family of potters, including her sister Marcella Yepa and her aunt Alvina Yepa. She has won awards at Eight Northern Pueblos Indian Arts & Crafts Show, and Santa Fe Indian Market.